Convention Linkage, Inc. consists of professionals in the fields of face-to-face communication and international communication. Our achievements and experience are rich and varied, ranging from conferences of the United Nations and governments, to large-scale academic meetings, major events, and exhibitions. We have received high acclaim from clients in various fields, who have concluded that we provide a fresh and creative service that achieves our motto of "the highest quality at the lowest cost." 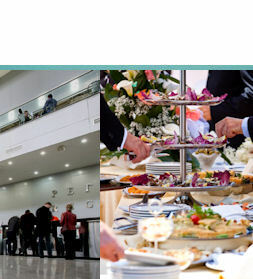 Services of Convention Linkage, Inc. 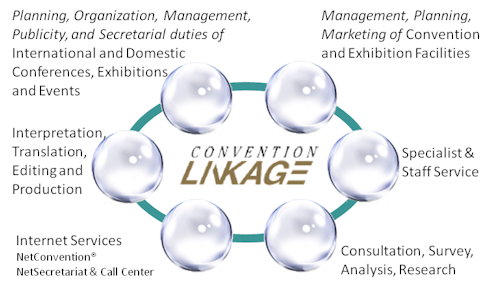 The Services of Convention Linkage, Inc. are grouped into six as shown in the diagram below. All of the service segments are correlated to one another to increase our knowledge and skills and to accumulate useful resources, which are used to produce a "great success" to the organizer and a "great impression" to each participant. 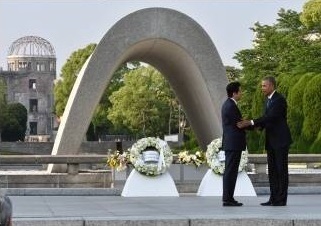 We have contributed to the success of the G7 Ise-Shima Summit and the historical visit of the United States President, Barack Obama to Hiroshima. We like to express our thanks for all the support from everyone involved in making this a memorable event. 10th Biennial Conference of the Pediatric Dentistry Association of Asia (PDAA2016) was successfully held in Tokyo. It was held in conjunction with 54th Annual Conference of the Japanese Society of Pediatric Dentistry (JSPD2016). Thank you to everyone who was involved and participated in its success. We have contributed to the successes of "G7 Ise-Shima Summit", "G7 Hiroshima Foreign Ministers' Meeting", "G7 ICT Ministers' Meeting in Takamatsu,Kagawa", "G7 Kurashiki Education Ministers' Meeting in Okayama", "The G7 Kobe Health Ministers' Meeting", and "The 16th Tripartite Environment Ministers meeting among Korea, China and Japan (TEMM16)". Thank you to everyone who was involved and participated in its success. G7 Kurashiki Education Ministers' Meeting in Okayama was successfully held. Thank you to everyone who was involved and participated in its success. G7 ICT Ministers' Meeting in Takamatsu, Kagawa was successfully held. Thank you to everyone who was involved and participated in its success. G7 Hiroshima Foreign Ministers' Meeting was successfully held in Hiroshima, April 10th -11th , concluding "G7 Foreign Ministers' Hiroshima Declaration on Nuclear Disarmament and Non-Proliferation". Thank you to everyone who was involved and participated in its success. GEA (Global Environmental Action) International Conference 2015 was successfully held in Tokyo with attendance of Their Imperial Highnesses Crown Prince and Crown Princess of Japan as well as the Prime Minister of Japan. Thank you to everyone who was involved and participated in its success. The Second China-Japan-Korea Trilateral Agricultural Ministers' Meeting (TAMM) was successfully held in Tokyo. Thank you to everyone who was involved and participated in its success. The 12th General Conference and Seminar of EASTICA was successfully held in Fukuoka. Thank you to everyone who was involved and participated in its success. The International Council for Central and East European Studies IX World Congress 2015 (ICCEES2015) was successfully held in Chiba. The XVIIth World Economic History Congress (WEHC 2015) was successfully held in Kyoto. The IPU (Inter-Parliamentary Union) Global Conference of Young Parliamentarians in Tokyo was successfully held. His Excellency Mr. Benigno S. Aquino III, President of the Republic of the Philippines, came to Japan as a state guest and gave a speech in the Diet. The Eighth Round of Negotiations for the Regional Comprehensive Economic Partnership (RCEP) was successfully held in Kyoto. The 29th General Assembly of The Japan Medical Congress was successfully held with attendance of his Imperial Highness Crown Prince of Japan and more than 400,000 participants. The UN World Conference on Disaster Risk Reduction was successfully held with attendance of their Majesties, the Emperor and Empress, concluding "Sendai Framework for Disaster Risk Reduction 2015-2030" and "Sendai Declaration". With more than two hundred staff members of Convention Linkage, Inc. assisting this conference and the UN Secretariat gave the letter of appreciation to us as a token of gratitude. Our new branch, LINKAGE HOKURIKU, has started operation in Kanazawa City. The Fourth Japan-CARICOM (Caribbean Community) Ministerial-Level Conference was successfully held in Tokyo. The Japan Society of Civil Engineer's 100th Anniversary Commemorative Ceremony International Symposium was successfully held at Tokyo International Forum with the attendance of his Imperial Highness Crown Prince of Japan. The Science Agora 2014 was successfully held in Tokyo. The Second Meeting of the OECD Global Forum on VAT was successfully held in Tokyo with attendance of more than 80 different countries. We have been chosen as the official coordinator for "The World Heritage Nijo-jo Castle (Kyoto) MICE Plan ". UNESCO World Conference on Higher Education for Sustainable Development in 2014 was successfully held in Nagoya. The 16th International Congress of the World Federation of Occupational Therapists in collaboration with the 48th Japanese Occupational Therapy Congress and Expo(WFOT2014) was successfully held with the attendance of their Majesties the Emperor and Empress in Yokohama. 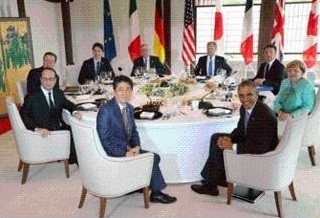 The Japan-US summit meeting and the joint press conference held in Tokyo were successfully concluded. The Pulse of Asia 2014 in ATHENS(POA2014) was successfully held in Athens with the support from Convention Linkage. The 2nd Sleep Summit of Asian Sleep Research and Sleep Medicine Meeting (ASSM2014) were held in Singapore. The 12th Congress of the International Society for Experimental Microsurgery (ISEM2014) was successfully held in Kyoto. Japan-China University Fair & Forum in China was held in Beijing and Shanghai. Japan-Turkey Summit Meeting was successfully held in Tokyo. The GEA (Global Environmental Action) International Conference 2013 was successfully held with attendance of their Imperial Highnesses the Crown Prince and Princess of Japan. The Fourth East Asia Local and Regional Government Congress was held in Nara. HUPO (Human Proteome Organization) 12th Annual World Congress was successfully held in Yokohama. IASC2013 (The 14th Conference of the International Association for the Study of the Commons) was successfully held with the attendance of his Imperial Highness Prince Akishino in Kitafuji, Shizuoka. TICAD V (Tokyo International Conference on African Development) was successfully held in Yokohama. Symposium on "ICT for Disaster Management" Learning from Japan's Experience from the Great East Japan Earthquake was successfully held in Tokyo. Informal Meeting for the Implementation of Article 19 and 20 of the Nagoya Protocol was successfully held in Tokyo. It now feels like Spring with Beautiful cherry blossoms viewing outside the Convention Linkage Tokyo Headquarters. 5th HOPE MEETING was successfully held in Tokyo. Sapporo/Hokkaido MICE Contents Mart was held at the Sapporo Convention Center. 24th United Nations Conference on Disarmament Issues was held in Shizuoka. The Fukushima Cabinet Meeting on Nuclear Safety sponsored by the Japanese government sponsorship and co-sponsored by the International Atomic Energy Agency (IAEA) cosponsorship was held in the Fukushima prefecture. The Third East Asia Local and Regional Government Congress was held in Nara. 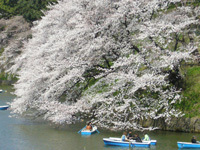 World Heritage Registration Promotion International Symposium was held in Ibaraki. 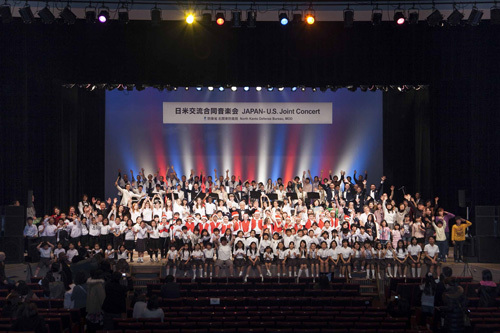 Japan and U.S. Exchange Combined Concert was held in Tokyo. The World Health Capital Conference was held in Nagano. Expert Meeting on Heritage and Societies - toward the 20th anniversary of the NARA Document and beyond - was held in Hyogo. The Afghanistan Tokyo Conference was held in Tokyo. CORESTA Congress 2012 was held in Hokkaido. World Wide Views on Biodiversity was held in Tokyo. 2012 ISBRA World Congress(16th Congress of International Society for Biomedical Research on Alcoholism) was held in Hokkaido. IBC 2012 (The 26th International Biometric Conference) was held in Hyogo. 7th World Congress of Veterinary Dermatology was held in Vancouver. A new branch, LINKAGE TOHOKU starts its operation in Sendai City (on June 16). East Asia low carbon growth partnership dialog was held on April 15th with the attendance of Prime Minister Noda and Foreign Minister Gemba. 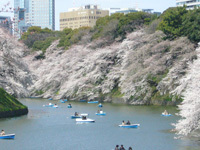 Japan EU Policy Makers seminar was held in Tokyo on March 5th and 6th. OECD Asia-Pacific Conference on Measuring Well-Being and Fostering the Progress of Societies has been held at the National Graduate Institute for Policy Studies (GRIPS), in Tokyo, December 5 - 6. IASGO 2011 (The 21st World Congress of the International Association of Surgeons, Gastroenterologists and Oncologists) has been held in Tokyo, November 9 - 12. Car Testing/Designing/Electronics China (Exhibition and Conference) was held on Thursday, November 3 and Friday, November 4 in Shanghai, china. Worldsleep2011 (The 6th International Congress of the World Sleep Federation) was held in Kyoto International Conference Center, October 16 to 20, 2011. India-Japan Global Partnership Summit (IJGPS 2011) has been held in Tokyo with more than 2,000 attendees including the Indian and Japanese leaders of political, industrial, and academic fields. Japanese ex-premiers Mori, Hatoyama, and Kan as well as Prime Minister Noda attended the summit. Fourth Summit of Japan, China, and Korea has been held in Tokyo with attendances of the Japanese Prime Minister Kan, Chinese Premier Wen Jiabao, and President Lee Myung-bak of the Republic of Korea. Kyoto Karasuma Convention Hall starts its operation at the center of Kyoto as a plaza for interexchange and communication among People, Matters, and Information. Fujinofumoto (Foot of Mt. Fuji) Expo 2011 was a successful event. To assist restoration of the eastern part of Japan after the disaster of the Earthquake and Tsunami, a festival was held at the Sapporo Convention Center. Started operation of Tokyo International Exchange Center. Saitama Prefecture assigned Convention Linkage, Inc. as the chief company to manage the Eastern Saitama Regional Development Center (Fureai Cube). We are preparing for its opening in autumn of 2011. Osaka Prefecture has assigned Convention Linkage, Inc. to manage MOBIO (Monodzukuri Business Information-center Osaka). Oita Municipal Government assigned Convention Linkage, Inc. to manage a complex facility "Compal Hall". Operetta "Heaven and Hell" was performed at the Beppu Convention Center (B-CON PLAZA). APEC JAPAN 2010 (Leaders' Week) was held in November 11 through 14 in Yokohama, concluding the "Yokohama Declaration". About a hundred staff members of Convention Linkage were involved with the operation. MOP5/COP10 (10th Meeting of the Conference of Parties on Biological Diversity) were held in Nagoya. More than two hundred staff members of Convention Linkage assisted the United Nations Environmental Program CBD (Convention on Biological Diversity) Secretariat. As a token of the gratitude, CDB Secretariat gave the letter of appreciation to each of Convention Linkage staff. The 69th General Assembly of the Japanese Society of Public Health was held with an attendance of more than 4,000 people. Convention Linkage, Inc. on May 22nd, signed a Cooperation Agreement with the leading Korean Convention Center COEX. Are you looking to expand into the Japanese Market? Copyright © 1999-2018 CONVENTION LINKAGE, INC. All rights reserved.